This yurt in Andalucia provides eco-friendly self-catering stays with the comfort of a hotel and a backdrop of mountains. The Green Mountain Yurt is a carefully crafted dwelling based on a Mongolian style of tent, but adapted for the climate of southern Spain and for those who wish to enjoy a glamping and camping holiday in comfort. Made by a local company based in Cadiar, The Yurt Workshop, our yurt is constructed from Spanish chestnut wood made into a strong frame and fitted with a fire retardant canvas cover and a thick wool felt lining to keep it warm when it is cool outside and to keep it cool inside when the sun is shining. Two large double glazed windows along with front door and transparent sky light ensure that the interior is light and airy, whilst a powerful' Jotul' log burning stove means there is never any need to feel the cold once inside this special canvas palace. To complete this comfortable accommodation, there is a full-sized double bed, with a two seater sofa and a small table for dining. It has a smart glazed front door and two large double glazed windows to let the light in and keep the weather out. Mosquito netting screens over the door, window and roof vent ensure trouble-free nights. We're pretty sure we have thought of everything to make your stay as comfortable as possible! To one end of the 'Yurt Shack' you will find the Green Mountain Yurt 'Eco' Bathroom. This is an enclosed room that has a shower, washbasin and a dry compost toilet. Manufactured in Sweden this clever toilet will allow you to break free of mains drainage by employing a dry composting method to deal with the that most delicate of matters! If you wander further from your yurt you will find yourself in the grounds of Cortijo Opazo, where our very own colourful gardens of exotic plants and shrubs are free for you to explore. Green Mountain Yurt is a single yurt, ideal for two people, situated in the grounds of Cortijo Opazo, in the Alpujarras of southern Spain. It can be ideal for a family since we can erect a small tent next to the yurt for children to sleep in. The yurt has a great log burning stove for rentals in cooler seasons, it has its own open air kitchen and a private bathroom with solar powered hot water and stylish compost loo! The Green Mountain Yurt is furnished with full sized double bed, 2 side tables, dining table with chairs, sofa, log burning stove, solar powered lighting, assorted rugs, cushions and soft furnishings. It has a glazed front door and 2 large double glazed windows to let the light in and keep the weather out, along with mosquito netting screens. Outside, guests have a large area of garden plus a vegetable patch, with out door furniture and sun loungers. 'The Shack', a timber construction, provides you with a shaded outdoor kitchen raised on a wooden deck. Here you will find all the equipment you need for cooking: crockery, plates, cups, glasses, cutlery, pots and pans for up to 4 people and various utensils. There is a sink with hot and cold running water, a twin gas ring stove and a gas powered fridge and food storage containers. At one end of the shack you will find the 'eco' bathroom; this is an enclosed room that has a shower, washbasin and a dry compost toilet. Hot water is provided in the kitchen and bathroom via a dedicated solar panel, and there is a basic solar lighting system in the bathroom, kitchen and yurt interior. Facilities for re-charging phones, laptops etc are available at the main house, as is a WiFi connection. Walking routes in and around the National Park of the Sierra Nevada are excellent and the area is a paradise for outdoor enthusiasts. Horse riding, canyoning and trail running are all popular, while swimmers can enjoy natural bathing in mountain streams and waterfalls. There is also a local public open air swimming pool within walking distance. Exploring the old villages of the Alpujarras is another obvious past time, the narrow village roads are often wide enough for traditional travel only (a donkey laden with local goods), and these rural spots still house some excellent rustic eateries. The coast of Costa Tropical is a 1 hour drive away, while famous Granada and Alhambra Palace (0034 958 027 971) is a 75 minute drive. Drinks and tapas await your arrival and home cooked meals can be ordered up to 24 hours in advance. Traditional Spanish, Moroccan and oriental dishes are available. Those who prefer to use the onsite cooking shack can use produce from the vegetable garden and eggs from the free range hens, or head into Pitres, 1.5km away, which is the nearest place for shops. Robert and William also supply a list of the best local eateries. Within walking distance, the lower villages of La Taha have between them a bar selling tasty homemade pizzas, a French owned vegetarian restaurant, a hotel with full restaurant menu and a traditional Spanish bar/restaurant selling delicious home cooked meals. Fly to Malaga, Granada or Almeria and hire car or catch bus. Driving directions will be sent at time of booking. 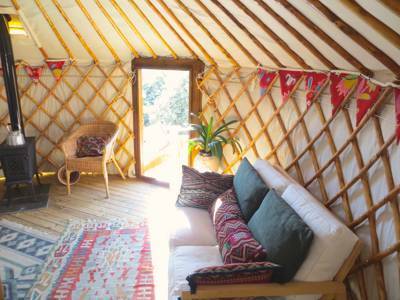 1 eco-friendly yurt with a private bathroom and outdoor cooking shelter.